Much of the commentary on Malcolm Fraser portrays him as the politician who moved most dramatically from the right to the left of the political spectrum. The man denounced by the left for his role in the dismissal of the Whitlam Government by the Governor-General, Sir John Kerr, in November 1975 became in his later years the left’s hero, as he denounced Liberal and even Labor governments, not least on the American alliance. His last book, Dangerous Allies, urged Australia to end the alliance and our ‘strategic dependence’ on powerful allies. How does this square with Fraser’s role as Minister for the Army and then Minister for Defence during the Vietnam War, a commitment of which he was one of the coalition government’s most articulate defenders? A close look at his actions in the 1960s and 1970s reveals some early signs of his later attitude to the American alliance. After ten years on the backbench, his first ministerial appointment, as Minister for the Army, came when Harold Holt formed his first government in early 1966. As Minister for the Army, Fraser made several visits to Vietnam and engaged with the issues the Australian Army faced there, including the pronounced difference in the tactics employed by the Australian and American armies. Fraser—like many of the Army’s leaders—wanted the Australians to focus their operations on one province, where they could utilise the counter-insurgency tactics that they had used skilfully, successfully and with minimal casualties in conflicts in Malaya and Borneo. He was concerned by the American reliance on advanced technology and heavy firepower, their willingness to accept high casualty rates, and their desire to use the Australians in combined operations over a wide area. But like the other service ministers, Fraser had little influence on policy. 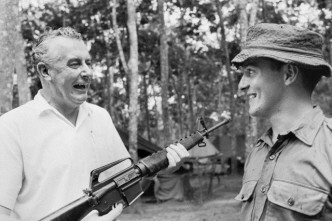 After the 1969 election, Prime Minister John Gorton appointed Fraser as Minister for Defence. The service ministers, the armed services and his own department now found themselves driven by an extremely active and assertive Minister with the power of a senior Cabinet portfolio. But his energy and vigour were not directed only towards Australians. Fraser long remained proud of his handling of the contractual arrangements with the Americans for the acquisition of the F-111 aircraft. Cost blow-outs and delays in production were embarrassing the Government. Fraser’s vigorous and confrontational tactics on a visit to Washington were based on technical advice that established weaknesses in the information provided by the Americans. While his critics continued to portray him as a pro-American hawk, Fraser was actually playing hardball politics in Washington. There was no suggestion at this time of a complete break from the alliance in pursuit of ‘strategic independence’. In the circumstances of the day, that would have been inconceivable: but Fraser was already indicating that he would not genuflect obsequiously before great and powerful friends. Fraser appointed the formidable Arthur Tange as departmental secretary, saying that he needed someone in that position who could stand up to him. The two men predictably clashed, before reconciling to form a powerful partnership. Fraser often described Tange as the public servant he most admired, and many of principles underlying the so-called ‘Tange reforms’ originated in Fraser’s term as Minister for Defence. They included not only the combining of three services into one Australian Defence Force and the uniting of five departments into a single Department of Defence, but also a new strategic approach that placed less emphasis on the American alliance and more on the defence of the Australian continent and its environs. 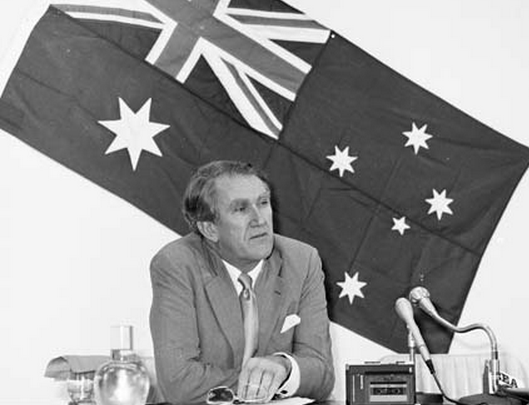 Although the ‘defence of Australia’ strategic approach is generally linked to the 1986 Dibb Report and the 1987 White Paper, many of the principal elements were outlined in a White Paper in 1976, Fraser’s first year as Prime Minister. Given the importance of the White Paper process in defence policy-making, it is worth noting that this was Australia’s first Defence White Paper. It would not have been surprising if Fraser had urged Australians to place less reliance on the American alliance last year. His call to end the alliance altogether was a step too far for many Australians, but it at least prompted some debate about the fundamental elements of Australian strategy. The reshaping of strategic policy is only one example of the ways in which Fraser, as Prime Minister, quietly consolidated and institutionalised many of the changes in national security policy and structures that were initiated, often with considerable flourish and fanfare, by the Whitlam Government. The reorganisation of the Australian Defence Force and the Defence Department was another. 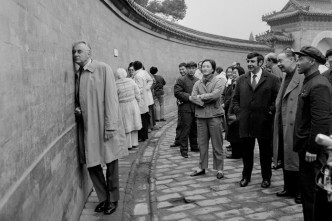 In foreign policy, Fraser continued more of Gough Whitlam’s policies than he reversed. He ensured that the development of positive relationships with China, Japan and Indonesia, and with as many of our other Asian countries as possible, became a bi-partisan policy. His sympathy for non-white peoples, sparked by his personal experience as an undergraduate at Oxford, was a consistent and prominent element in his foreign policies as Prime Minister, not only in Asia but also in his opposition to South African apartheid and his support for the independence of Rhodesia/Zimbabwe. The greatest change in foreign affairs was probably in relation with the Soviet Union. Fraser rescinded Whitlam’s unwise de jure recognition of the incorporation of the Baltic States into the Soviet Union. Fraser reacted vehemently to the Soviet invasion of Afghanistan and he encouraged Australian athletes to boycott the Moscow Olympics in 1980. 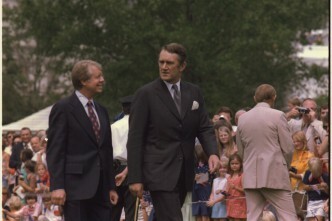 Three successive Prime Ministers – Whitlam, Fraser and Bob Hawke – shared responsibility for a comprehensive reform of Australia’s intelligence and security agencies. All three commissioned the same man, Justice Robert Hope, to conduct a series of inquiries, which established structures and roles for the agencies that retained bi-partisan support for decades. In many aspects of national security, Fraser’s term as Prime Minister did more to consolidate than to reverse the reforms often associated with Gough Whitlam. It was not altogether surprising that, in their later years, the two men became close, notwithstanding the bitter tensions associated with the Dismissal. Peter Edwards is a leading historian of Australia’s defence and foreign policies, is currently an Australian Prime Ministers Centre Fellow. This article is adapted from one on the APMC blog. Image courtesy of National Archives of Australia.